The guidance was initially based on the approach designed in the CAST project (Delhomme et al., 2009). Although the CAST manual was designed for conducting communication campaigns to improve the road safety, its general reference framework composed of several steps and their subsequent actions can be adapted and applied to other contexts and problems. During the development of the Toolbox, the means of analysing, implementing, and evaluating a preventative measures has largely been modified and extended to fit with the prevention of suicides and trespassing accidents in the railway context. The RESTRAIL approach is not a linear step-by-step process, although the steps taken in the guidance are shown as a perfect logical succession. 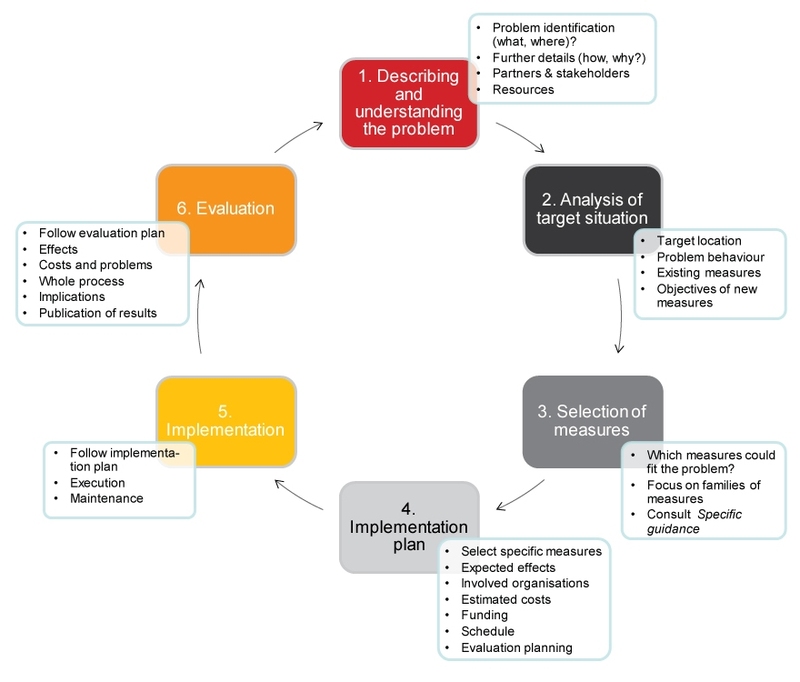 It is rather a spiral, incremental approach, in which the interfaces between the steps in the process are recurrent, allowing an iterative analysis and decision process (see the figure below): identification of the problem; analysis of the problem (including the effect of measures already taken); identification of possible measures; selection of promising measures; implementation of the measure(s); evaluation of the measures taken. It is important to note that the process could start again on the basis of the results of the evaluation, which is more likely to lead to an adjusted solution. After each step or after one round the process can be applied again if the first solution is not considered good enough. Likewise, after several iterations the solution may change or may include more alternatives, such as single measures or combination of measures. Context is a key issue for preventative measures, since both their implementation and evaluation generally depend on several contextual factors. Examples of such factors are the following: (1) cultural issues, (2) socio-political organisation, division of skills and responsibilities, (3) demographics, (4) economics, and (5) the nature of the problem (type of incident, motives, location characteristics, etc.). Context constrains local adaptation of measures, but can make generalisation difficult. The context should also be taken into account for the design of evaluation. The approach presented in the general guidance allows a detailed description of the context and the design of an optimal solution through variables for analysing a problem. Each step in the process provides specific answers to be further used and may need specific tools.